It was already going to be a brutal/killer week for me IRL and a tiring one (first of the semester). Then we find out Davis wants out at horrible timing (before deadline), then predictably see he wants to go to the Lakers (or Knicks). He also apparently only views Boston as a "rental option" according to reports (even from Shams) so that's not encouraging. Then to make it worse, now there's legitimate concern about Kyrie's future here. I personally still think he'll stay here but I'm definitely a little less confident than before. But the fact that there's even a 1% chance that he leaves the C's for the Lakers just leaves a bad taste in my mouth. Idk guys. Idk. 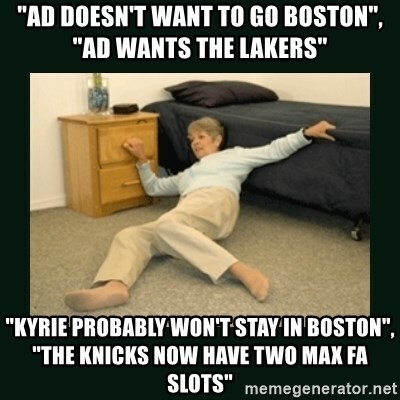 Hopefully Ainge has a plan and/or they've had internal discussions with Kyrie and everything's good there, otherwise while not acquiring Davis wouldn't be so bad, losing Kyrie would actually be unless you think Wannamaker/Smart/Brown can replace him as the star PG, or if you're confident we can draft a future PG with the Kings Pick (since we won't really have cap space to acquire another star FA regardless). I think that's another reason Ainge will keep Rozier, as a Plan B to quickly re-sign if Kyrie does go to the Knicks. Another aspect of this is, it seems the media is trying to also separate the Golden State players this summer and get them all to NY or LA. Durant is in Knicks rumors, Klay in Lakers, and there's some belief they may flip Draymond somewhere too (possibly even NY). Then of course since Kyrie may be the best PG in FA along with Kemba he's being pushed away from Boston as well for LAL or NY. i am not so sure what is so terrible about this week, which ends with a game against the hapless knicks. so, davis talks about leaving NO and may not come here. woe is us!!! you mean the team must move forward by keeping tatum and brown and draft picks? that is the purgatory into which we are being cast? for me, i will do less fretting about these hypothetical chicken little frets and more snickering over how awful the knicks are and how much better the celtics are. I still don't see the benefit of going to the Knicks as long as Dolan is there. I mean, think about it, Porzingis pretty much demanded a trade out of there. He questioned their culture and commitment to win. That seems like a pretty big deal that a 23 year old (and their best player) is making those statements but no one brings it up in the national media because they now could land 2 max-FA's. But if they can't, then yikes. Golden State will have some decisions to make but I think they'll have no problem getting rid of Draymond and letting Cousins walk if it means keeping Klay and KD somehow. i am not so sure what so terrible about this week, which ends with a game against the hapless knicks. Good week in my book. AD decided he wanted to leave New Orleans. That puts him in the trade market and Boston is the front-runner to get the most talented player in the league. Not concerned about Kyrie. Most of the talk in the media feels like nonsense and his commitment to the team still feels high albeit not absolute. The timing of the AD trade request still seems odd to me. I think he should've done it sooner if he really wanted to force his way out of that team before the trade deadline. He left too short a window. Easy for New Orleans to sit back and put off the decision until the summer. If AD had come out a 4-6 weeks ago + put the team under pressure through the media + been a horrible person around the team in practices and in games, dogged it a bit, yell at teammates, yell at coaches, just create a bad atmosphere = he could have easily forced his way out of the team before the trade deadline. He did none of those things. And he didn't give himself enough time to put his team under serious pressure before the deadline. New Orleans can just sit back and ride the next week out. Then all the pressure dies down and they can make a comfortable decision in the summer. A week is easy. Anyone can sit tight for a week. The timing of it doesn't trouble me. That this trade request happened at all is reason for optimism. Everything is coming together. Ainge's plans are coming to fruition. He has the team best placed to land the best player in the NBA. It seems perfectly reasonable to me that he'd ask for a trade once he decided that wasn't going to re-sign with the Pels. Why would he wait? If a deal gets done before the deadline, then he'll play in the playoffs this season. By waiting he'd also give the Pels organization and fans false hope that he might re-sign with him and he'd suffer a lot more backlash when he decided not to. If he did wait, it would actually be worse for us because he wouldn't decide until free agency and it would be difficult to have a tentative deal in place by the draft to take the players that the Pels would prefer. @Who & @Tazz, what you both say makes better sense. At this point now all we have to hope for is that AD isn't traded before this deadline. That said there's still the issue of whether we're giving up the farm without some commitment or wink-wink long term agreement with AD. The Shams tweet doesn't look good in that regard for us. i love the reports of NO not picking up the LA phone calls , dragging their feet with LA . making Bron and Magic bend over and take it with a smile is to be treasured. Even if they take Brons offer , you know he demanded everything and kitchen sink be thrown in . After all, he needs help,.....the greatest player on the planet ! I think NO FO is having a great time holding Brons nads and squeezing . Im injoying watching NO make Magic and Bron dance to somebody elses tune . I hope they wait till 10 seconds before the deadline to announce their decision. ESPN reported Thursday the Lakers are his only long-term choice, and if Davis is traded to another team he would regard it as a "one-year stop" before signing with the Lakers in free agency in 2020. "I never gave the Pelicans a destination or anything so I'm not sure where that’s coming from," Davis said Friday, via the New Orleans Advocate. So Davis is already walking back on comments Rich Paul associated him to. I actually didn’t. Thanks for that! Yah honestly there’s just so much going on that if I’m not here even for just 30 minutes I miss 10 quotes, 5 trades, 2 more players demanding trades, etc. If he get to the finals and Kyrie re-signs, AD will be open to coming to us. If we get bounced in the 1st or 2nd round and Kyrie walks, he won't. There’s a youtube clip of AD saying that, and a lot more. He consistently says it’s up to the Pelicans where he goes.